The repeal of the Affordable Care Act with its current provisions for Medicaid did not materialize at the federal level last year; however, states are exploring reform individually by way of Medicaid 1115 waivers. These waivers focus on priorities within the states and permit local governments the flexibility to test coverage models that do not reflect program rules of the federal government. Medicaid 1115 waivers give states the opportunity to waive key provisions of federal law. The changes made possible by Section 1115 waivers aren’t as dramatic as those contained in the failed bills — for example, states can’t use these waivers to fully restructure Medicaid under block grants or per capita caps, nor can the federal government use them to take away federal reimbursements for Medicaid expansion — but they are still significant. In an effort to “support states helping Medicaid beneficiaries improve well-being and achieve self-sufficiency”, CMS issued new guidance for waivers that imposed work requirements on January 11, 2018. In addition to work requirements, states are also considering provisions such as eligibility time limits, drug testing, and premiums. Consequently, these waivers are controversial and have raised policy issues around the country. Currently, a number of states have submitted waivers for authorization from the federal government. Here is some of the highlighting waiver activity within the states. New Hampshire was the fourth state to be approved by the Trump administration for Medicaid work requirements. Under the state’s Medicaid 1115 waiver, able-bodied adults will either need to work, develop job skills, or participate in community service in order to receive premium assistance and program benefits from the state’s Medicaid expansion. Critics of the waiver are concerned that its ramifications will not support the original goals of the Medicaid program. A number of Democratic legislators are in opposition to the work requirements, believing that they undermine access to the healthcare program. Supporters of the waiver see it as means of protecting the program’s sustainability. They argue that Medicaid should be reserved for the nation’s most vulnerable and low-income individuals and families. Support for Medicaid expansion in Kansas came to a halt in February despite efforts from the Senate Public Health and Welfare Committee and House Democrats. Kansas Governor, Sam Brownback (R) vetoed the bill. Had it been approved, an estimated 150,000 residents would have been eligible. While expansion failed, Kansas is one of five states, including Utah, Maine, Arizona, and Wisconsin, to request lifetime limits from CMS. This would have allowed the state to limit coverage to three years/36 months for some of its recipients. CMS has rejected the request making Kansas the first of the five states requesting lifetime limits to be denied. Kentucky was the first state to receive approval from CMS for an 1115 waiver (January 12, 2017). The waiver will implement work requirements, monthly premiums for low-income parents and expansion adults, dis-enrollment and coverage lockouts, the elimination of retroactive eligibility, the addition of deductible and incentive accounts, and waiving non-emergency medical transportation. Kentucky’s governor, Matt Bevin (R), plans to begin the overhaul of the state’s Medicaid program on July 1, 2018. It will start in Campbell County and spread throughout the state over a period of six months. These changes will primarily affect able-bodied residents with incomes up to 138% of the federal poverty level that received coverage during the program’s expansion in 2014. As a result of the overhaul, it’s estimated that Kentucky and the federal government will save $2.2 billion over five years. Additionally, the Center On Budget and Policy Priorities estimates that over the duration there will be a 15 percent drop in adult Medicaid enrollment. On January 24, sixteen Kentucky Medicaid recipients took legal action and sued the federal government over the waivers provisions. The group sees the Trump administration’s approval as a violation of numerous federal laws and a risk to the lives of tens of thousands of low-income families. CMS approved the amended extension of Healthy Indiana 2.0 on February 1. Originally, the state’s waiver expanded the program under the Affordable Care Act (ACA) from February 2015 through January 2018 by altering the states pre-ACA limited coverage expansion waiver, Healthy Indiana Program 1.0. While other waivers focus on adults enrolled during expansion, Indiana’s also includes changes to the terms of coverage for non-expansion adults. This encompasses low-income parents and those eligible for transitional medical assistance. Healthy Indiana Program 2.0 includes provisions such as: increasing premiums by 50% for tobacco using members starting the second year of enrollment, eligibility work requirements for most adults in 2019, dis-enrollment and coverage lockouts, introducing a tiered premium structure, and restricting transitional medical assistance eligibility to between 139% and 185% of the federal poverty level. While there are a number of exemptions in place to help beneficiaries secure and retain coverage, the introduction of these provisions will surely alter program eligibility. Now that the state has received approval for their provisions, Indiana faces the task of implementing them. Arizona is looking to modernize and reform their Medicaid program, Arizona Health Care Cost Containment System (AHCCCS). At the moment, the state has pending Medicaid 1115 waivers with CMS. The amendments include a retroactive eligibility request, an Institution for Mental Disease (IMD) waiver, work requirements, and an uncompensated care payment model. Originally, Arizona also requested for approval of a 5-year lifetime time limit on Medicaid enrollment. However, this was recently removed from the state’s requests after CMS rejected Kansas’s similar request for a 3-year time limit. No other state currently has lifetime limits. In regard to the decision to postpone the lifetime limit request, Deputy Director of AHCCCS, Jami Snyder said, “We have removed the lifetime limit from the waiver request, really for the purpose of expediting approval of the work requirements request.” Currently, Arizona is still in discussions with CMS. 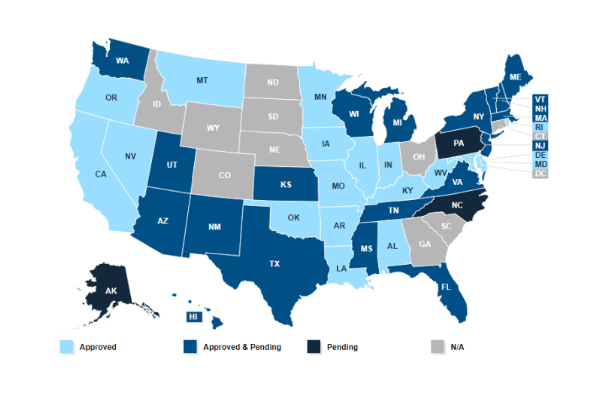 Regardless of the federal government’s inability to reform Medicaid, states are now taking the initiative to do it themselves by submitting 1115 waiver requests to CMS. Across the country, local governments are now considering provisions such as work requirements, drug testing, lifetime limits, and premiums. Some states have received approval while others are facing strong resistance. While reform through Medicaid 1115 waivers is welcomed by many state legislators, the way in which they are implemented will be critical to ensuring the future of the Medicaid program.